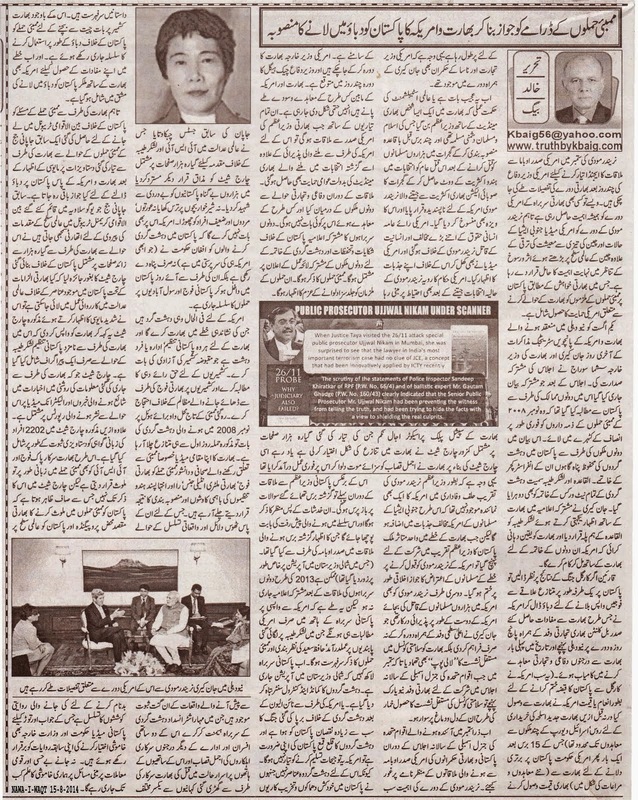 Truth by Kbaig: US-Indian Plan to Pressurize Pakistan on the Basis of Mumbai Attacks..! US-Indian Plan to Pressurize Pakistan on the Basis of Mumbai Attacks..! Visit of US Defense Minister had been scheduled in order to finalize the details of Narindra Modi’s visit to America and meeting with US President in September 2014. Every Indian Prime Minister’s visit to USA had some importance but American media is giving special importance to Narindra Modi’s visit in the light of situation in South Asia and developing economy of China coupled with increasing influence in the region. 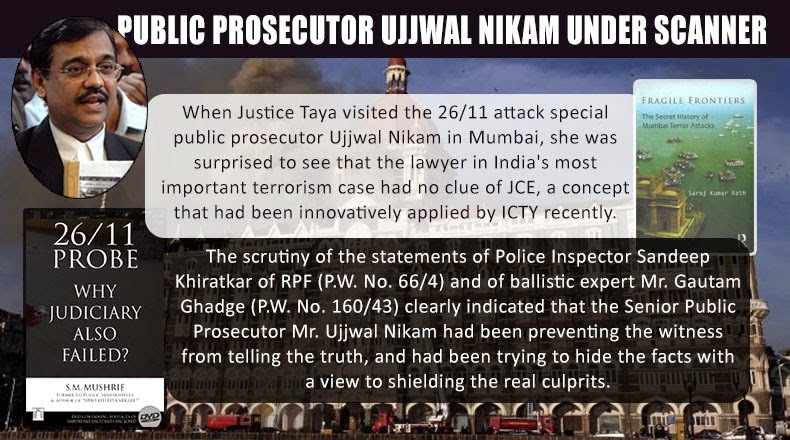 This also includes procuring American support for arrest of those accused for Mumbai attacks on the will of India. 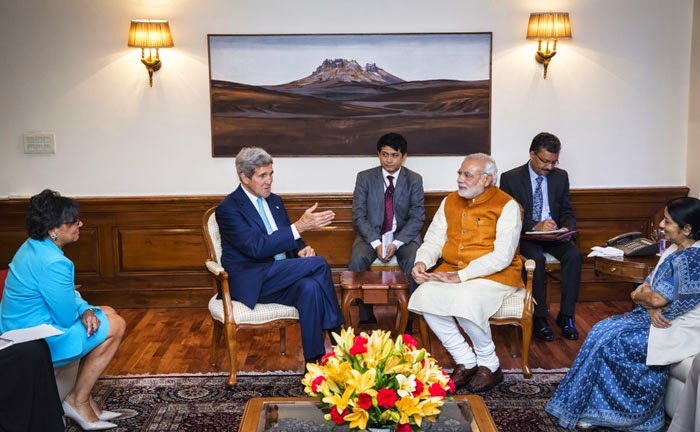 On 1st August 2014, John Kerry and Shushna Suraj presided the last day meeting of the5th US-Indian Strategic dialogues. The joint declaration demanded Pakistan to bring those people to justive who had been accused by India for Mumbai attacks in 2008. Demands for end of terrorist networks like Al-Qaeda and Lashkar-e-Taiba (LeT), destruction of hideouts of terrorists and their infrastructure were repeated as well. John Kerry claimed LeT equivalent to Al-Qaeda and assured India that USA would work side by side with India for end of LeT. If one looks at the Kargil War; USA pressurized Pakistan to withdraw forces from a disputed area and exploited it to procure various interests from India, US President Bill Clinton visited India along with his trade envoy and signed dozens of trade and defense deals. All this was either the prize or price of US pressure over Pakistan to withdraw forces from Kargil and accept defeat diplomatically otherwise before this India used to buy weapons from Russia, Israel and few countries of Europe. After 15 years once again US govt. is preparing to pressurize Pakistan to accept Indian supremacy and cash it for big deals. That is why US Trade Minister and NASA Officials accompanied US Defense Minister as well. Now this is the coincidence or plan of international establishment that murderer of thousands of Muslim in Gujarat and whose enmity towards Muslims is open became the Prime Minister of India. Few years ago when Narindra Modi exploited his genocide of Muslims in Gujarat to win the elections, he was termed as PERSONA NON GRATA by USA and his US visa was cancelled as well. US community was against such a big murderer of humanity and US media also expressed emotions against him openly. After success of Modi in elections, Americans remained cautious towards Modi that is why no American representative was present in the oath taking ceremony that this might fuel Muslim hatred against USA. But when the Prime Minister of only Muslim country of the region effected by Hindu Extremism participated in this ceremony; Muslims of the region had no objection left against USA for relations with Modi. On the other hand Modi also required acceptance in USA as friend not as murderer of humanity; which was not only provided by visit of John Kerry along with higher officials but also gave lollypop of permanent seat in UN so that when Indian envoy visits New York to attend annual session of UNO they are intoxicated with the dream of permanent seat in UNO. Lets look at the meetings of Pakistani and Indian Prime Ministers with President Obama in September 2014, the importance of Modi’s visit is clear. American Foreign Minister had visited India and visit of Chuck Hegel is expected within few days; what kind of deals would be signed between India and USA their details are being finalized, in such situation when Indian Prime Minister would meet Obama he would have all the American support and public mandate with him. What and which type of deals have been signed during meeting; would not be mentioned. Joint declaration would consist of complaints and concerns against Pakistan and joint strategy or efforts against Pakistan; Mumbai attacks would be mentioned and promise would be renewed to punish accused of these attacks. In contrast to this Pakistani Prime Minister would be asked about the demands and DO MORE handed over to him last year; those concerns that Obama had shared last year would be discussed and progress on fulfilling US demands would be asked including demand for operation in North Waziristan. Probably like 2013, no joint declaration may be issued but on the end of the meeting Pakistani Prime Minister will have questions asked by Obama, progress over ban on LeT, arrest if Hafiz Saeed and Mumbai attacks would be on top of the list. No matter Pakistani PM says that Command and Control Center of terrorists had been destroyed, operation in North Waziristan is in progress, or the loss that Pakistan had to bear in US Terror war after 9/11 and end to terrorism is Pakistan’s own need; USA would not accept them. Because for USA terrorists are not those who commit suicide bomb blasts, derail trains, involved in target killing and organized commando attacks on defense installations in Pakistan (because they are all trained by US ally India), who have murdered hundreds of thousands of innocents and are enjoying protection of Afghan govt. controlled by USA and launch attacks from Afghanistan. America had interests linked with India and for USA terrorists are only those pointed out by India, for India every Pakistani department, organization or person who supports and talks for the innocents of Indian Held Kashmir are terrorists. 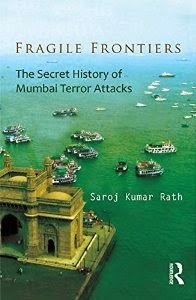 As long as Mumbai attacks are concerned they are disputed from the day first; Indian local media claims that Indian army and terrorist organization RAW staged the whole drama to remove Hemant Kurkure on the one hand and launching propaganda war against Pakistan on the other hand. They have evidence to support their claims and own stories to tell in contrast to state fabricated tales. In spite of all this in order to hide her crimes in Indian Held Kashmir and avoid talks India is continuously highlighting attacks over Mumbai and USA had also joined hands with India in order to procure her interests in India and pressurize Pakistan.